Quickly seal off vent openings with Duct Cleaners' Supply grill mask. Grill Mask is a self adhesive film which sticks to vent covers. This can be used to seal grilles when cleaning. 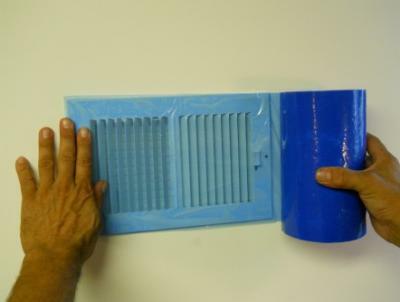 Works well on wall and ceiling vent covers and won't fall off like paper or cardboard. Blue color helps you remember to remove it at the end of the job. Roll is 300' long, 8" wide and perforated every 4 inches for easy use.